If you want a quick and easy homemade baby gift, this self-binding flannel receiving blanket is the project for you. 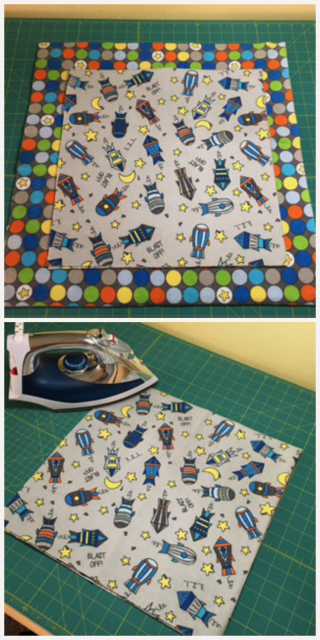 Start with a 30" x 30" square of focus fabric (spaceships) and a 40" x 40" square, which will serve as your binding/backing fabric (polka dots). To prepare your 30" x 30" square, you will need to fold it in half, starting with wrong sides together. Then fold rectangle piece in half to make a smaller square. Press the very edge of the (two) folded edges with a hot iron. This will make a crease in your fabric. Repeat this process with your 40" x 40" square. When assembling the two pieces together, you will match each piece by lining up the creases to the opposite fabric. Assembly: Walking foot is recommended but not necessary. Lay your fabrics right sides together, matching all four of the crease marks to the opposite fabric. Pin each crease in place. 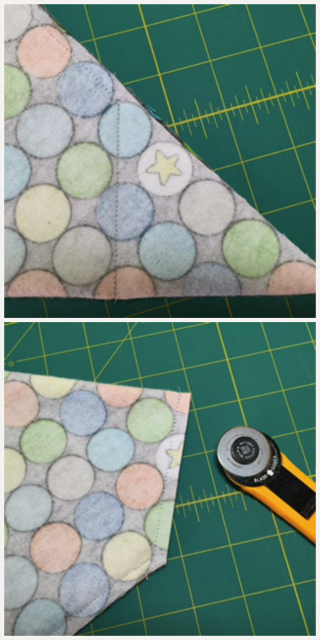 Pinning in several places will help keep your fabric from shifting while sewing together. Your 30" x 30" square will not match the end of your backing fabric. Lay blanket pieces on a flat surface with your 30" x 30" fabric on top. 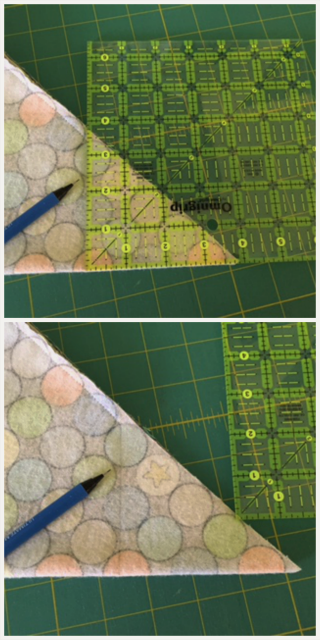 With a small ruler, mark each corner 1/4" away from the end of your fabric edge. This will be your starting and ending stitching points for each side. Using a quarter inch seam allowance, sew one side, starting and stopping 1/4" from each end. Repeat on two more sides. On the last side, mark a 4-inch opening. Stitch, leaving the opening for turning your blanket right side out later. 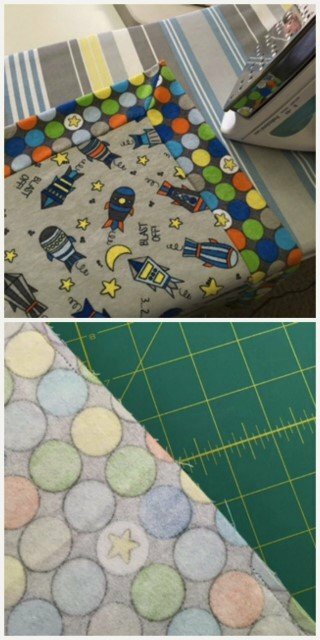 While blanket is wrong side out, fold each corner, matching raw edges together, pin in place. (refer to picture) This is called a "bunny ear". Your "bunny ear" should form an even point, or as close as you can make it. If you are slightly off, you will still be okay. A larger mismatch of edges will cause the blanket to be uneven. If the corners are not matching up, retrace your steps and check the center marks of each side. Often, your flannel will stretch as you sew it. Remember: pinning will help reduce the movement of your fabric as you sew. NOTE: This is the most important step in the whole process. Pay close attention to the picture and lay your 6.5" ruler along the bottom of the corner (folded edge facing down). It's VERY important that you lay your ruler down as shown in the picture! If you sew the corner any other way than instructed, it will not create a perfect mitered corner. Using the edge of the ruler, draw your stitching line. This line is drawn from the raw edge (top) to the bottom edge (folded). Sew along the line. BEFORE trimming the excess fabric, turn the corners right side out. You should have a nice mitered corner, one that lies completely flat. Once you are satisfied with your corners, turn the blanket wrong side out and trim excess fabric, the "bunny ear", to a 1/4" seam. Clip the very tip of your corners, but be careful not to cut your stitching line. This will help create a smooth tip on each of your finished corners. I've known people who have laid their ruler backwards and sewn their line the wrong direction. They trimmed off the "bunny ear" and the corner didn't lay flat. There was no going back! ALWAYS CHECK BEFORE TRIMMING THE CORNERS. Now you are ready to turn your blanket right side out. PRESS blanket, being careful to press, not iron your finished piece. This will keep your blanket even. When pressing under the raw edge of your 4-inch opening, make sure it flows evenly with the edge of the blanket. I like to make sure I press at least 1/4" under. Pin opening in place. Finishing your blanket. Set your machine to your desired decorative stitch. Stitch along seam, starting 1 inch from seam opening. Make sure back of blanket is smooth. The decorative stitch will quilt the front of the blanket to the back. Once you've made your first blanket, you will find yourself sewing one in less than 3 hours. 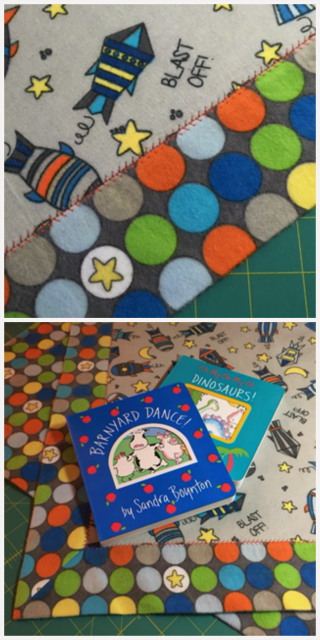 I like to tuck a couple of board books in with the blanket for a perfect handmade baby gift. Make sure your binding is full. 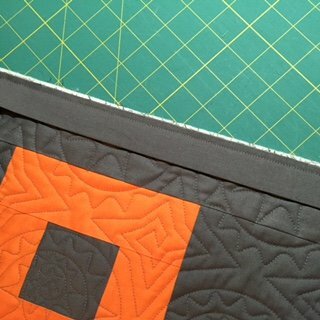 When you prepare your quilt top for the binding, trim the excess batting and backing off leaving 1/8" of the batting and backing sticking out beyond the quilt top. 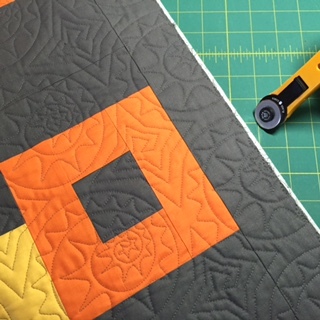 Align your binding with the edge of your quilt top. Leave the 1/8" of batting and backing sticking out beyond the edge of your top. 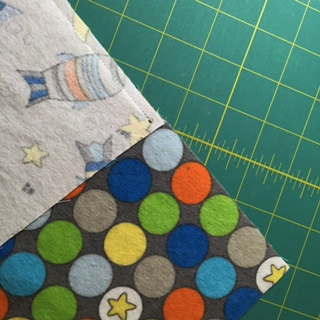 Sew your binding to the front of the quilt top using a 1/4" seam. 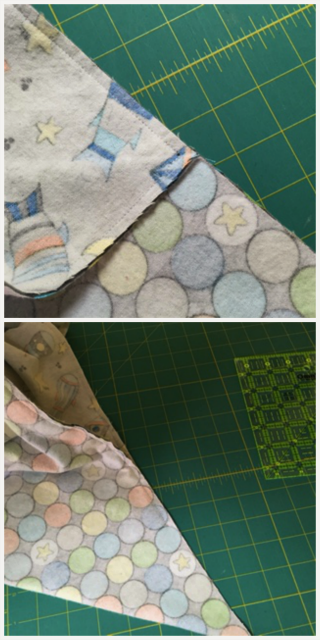 Fold your binding to the back and hand or machine stitch. When you pinch your binding it will feel full not flat. My friend Laura taught me this simple trick during a class at our local quilt store many years ago. She said the judges will check your binding for fullness if you enter you quilts in a quilt show or local fair. 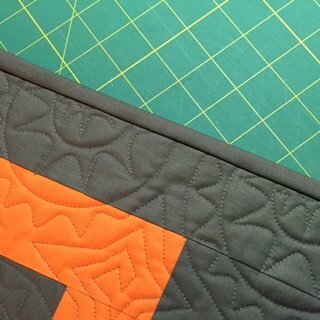 Hand stitching bindings on my quilts is one of my favorite ways to relax after a long day at work!